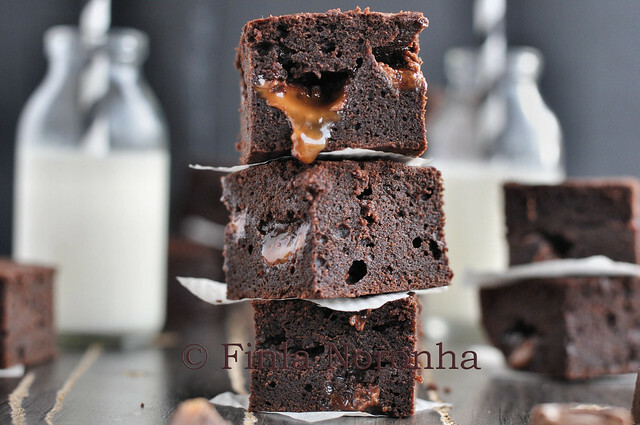 I have couple of brownie recipes in my blog, I think I shoudn't bore my readers again with more infromation of the orgin of the brownies and the popularityof this delicious bake. I had no plans to make any brownies untill I saw this brownie post in Sra's page and then for days I only thought about brownies. Had planned to make the one she made but I didn't had drinking chocolate. So then I thought I will make another recipe which I have been eyeing too. When I saw the recipe in the Delicious magazine , I knew I will make them as they were looking so good. Ok in the recipe they said serve with ice cream which I didn't do. 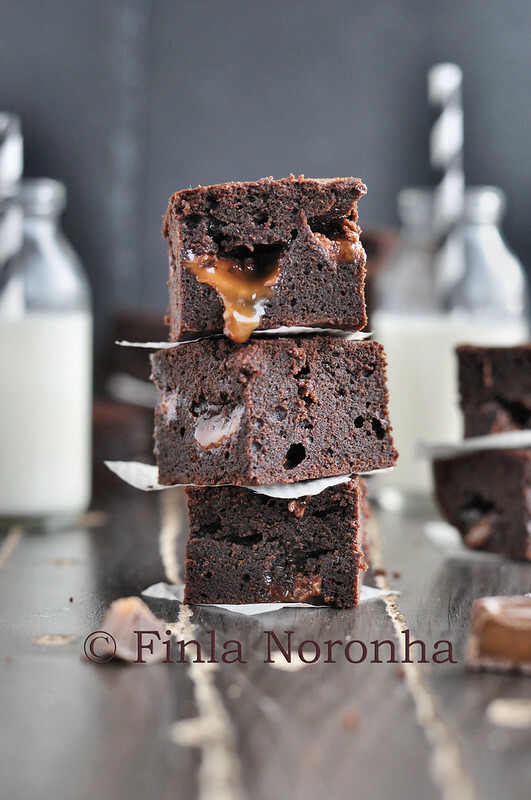 I would suggest do the recipe exact if you love sweet brownies, as the first time I made them, I made with chocolate which is 90% cocoa solids and lesser the sugar and also didn't add all the rollos. After tasting them if you are not a fan of really bitter chocolate I would say do like the recipe in below and be sure to add all the rolos as I thought it was a mistake I didn't add them all when I made them. Pre heat the oven to 170°C/fan150°C/gas 3½. Grease and line a 20cm square cake tin so the baking paper comes higher than the tin. Melt the 200g butter and the chocolate together in a saucepan, stirring, over a low heat. Don’t overheat as the chocolate may seize. Allow to cool slightly. In another mixing bowl, beat together the sugars, eggs and vanilla extract until pale and fluffy, then stir in the cooled melted chocolate to combine. Sift in the flour and cocoa, then fold through the batter with the sea salt to taste. Mix the chopped Rolos into the batter, then pour into the prepared tin. Press the whole Rolos into the surface. Bake for 25-30 minutes until firm to touch but still gooey in the middle – they’ll continue to cook as they cool. Leave to cool completely in the tin, then transfer to a board and slice. If you’re stuck for time, put them in the fridge to set. This looks so rich and loaded with chocolate! Absolutely divine, Finla. 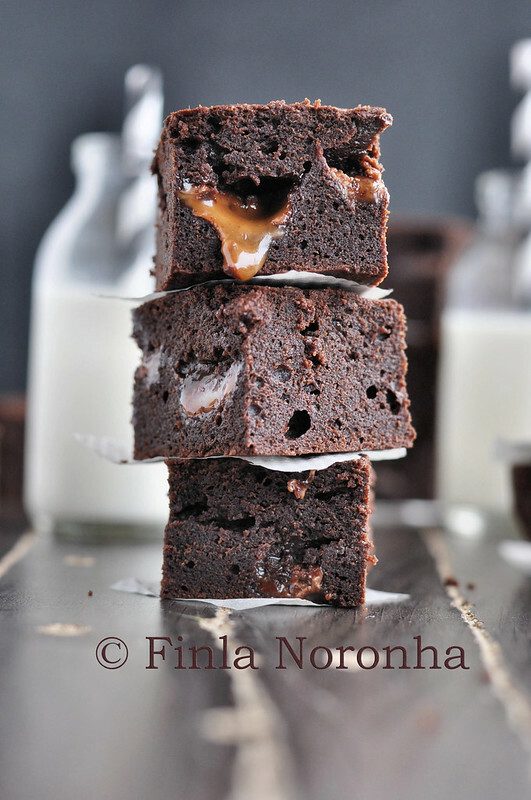 Mindblowing brownies, oh god who can resist to these incredible brownies. They look really delicious! I don't think I've ever seen Rolo, though!